Episode: 64. Site Number: 031. Date Posted: 4 August 1998. Update 20 March 2000. Location: London, UK. Type: Place. The Savage Club has been host to more than one polar explorer at its frequent house dinners, dinners that continue to this day. This London club was born in 1857, named "in a spirit of pure wantonness" for Richard Savage, "...a thoroughly disreputable actor and playwright of Dr Johnson's time who killed a man in a brawl and was later imprisoned for debt." The Club's physical presence has shifted here and there over the years. 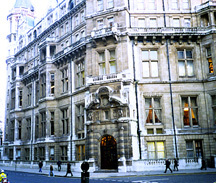 At the moment it has a room or two at the National Liberal Club, a gigantic pile of Victorian masonry at 1 Whitehall Place SW1. 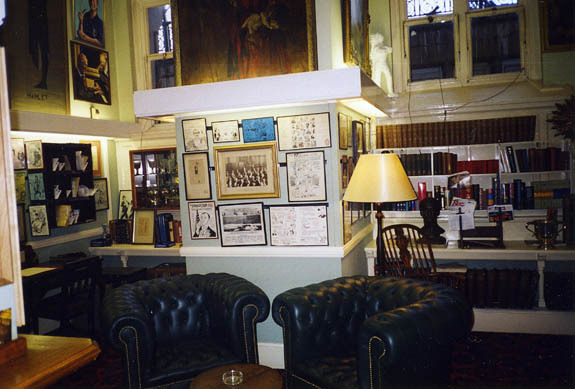 Not long past the Club had quarters in the Lansdowne Club in Berkeley Square and before that at a long string of other addresses. However, for 50 years starting in 1888, the Club leased premises in a since-demolished house in Adelphi Terrace. No doubt it was here that the Savages, "probably the warmest-hearted clubmen in London," gave dinners for Nansen, Scott and Shackleton. Mementos of these house dinners--member-designed menus--adorn the walls of the Club. 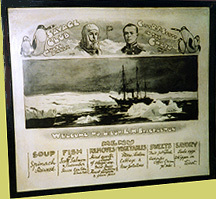 The only one with an Antarctic connection on display during my visit in early February (Savages are warmhearted and I spent most of an afternoon in their company) was for a dinner to welcome home Ernest Shackleton, held on June 19, 1909, a mere five days after the explorer's return to England. The menu: Spinach Soup, Scotch Salmon, Hindquarter of Lamb, Roast Duckling, Cabbage & New Potatoes, Kipper on Toast, et al. There are portraits of a balaclavered Shackleton and Scott (in the chair that evening) at the top of the menu; also a very nice view of the Nimrod forging through the ice (it resembles Marston's painting opposite page 124 in vol. I of The Heart of the Antarctic), not to mention the two penguins smoking cigars! According to Mill, "Shackleton solemnly signed his name in the wall behind the chair, to be glassed in later like the autographs of Nansen and other great travellers..." Supposedly the wall in question was hacked away and carried along as the Club moved from place to place. We had a good look around but no initials could we find. 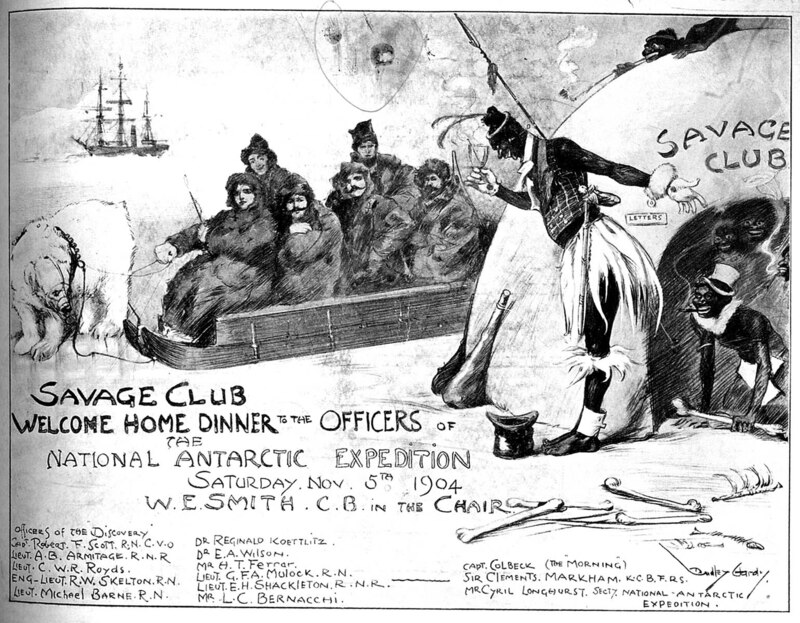 A few years earlier--November 5, 1904--Shackleton had also been welcomed home at the Club (the Dulwich College Archives has a photostat of the menu). And earlier still, on the 6th of July, 1901 (one month before Discovery departed England), there was a farewell dinner for the "Officers and Members of the Antarctic Expedition." 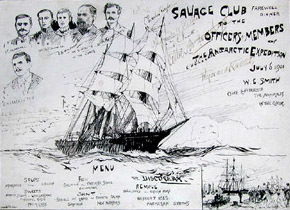 Drawn by Charles Dixon it shows the Discovery under sail and has portraits of six of the expedition members, including Scott, Wilson and Shackleton. The menu I have in my collection for that dinner has, among others, the signatures of Scott, Shackleton, Armitage, Skelton, Royds and Koettlitz. There are other clubs here and there with an Antarctic connection. I'll leave them for another time. Thanks to Savage John Wade and The Gentlemen's Clubs of London, by Anthony Lejeune and Malcolm Lewis (London: Dorset Press, 1979).